Recognised for their sizeable ears, remarkable memories and trumpeting trunks, elephants, I have learned, are also surprisingly light on their feet. Freakishly light. It wasn’t until I felt a shadow creep over my head and turned around to see that an 8 foot elephant had silently positioned itself at my back, that I realised this fact. Interestingly, an average adult Asian elephant weighs 3 tonnes and can run up to speeds of 23km/h but puts less weight on the ground per square metre than a deer. This was the first of many extraordinary abilities that I was to learn about elephants on my visit to Chiang Mai’s Elephant Nature Park (ENP) in northern Thailand, a rehabilitation sanctuary that offers medical care and reassurance for mistreated elephants. The park is unlike any other: not only does it offer you the chance to get inescapably close to elephants in more natural surroundings; it is also a learning centre educating its visitors on the dangers of elephant tourism. When I heard about this unique elephant haven, I immediately wanted to see it for myself. So taking advantage of the lengthy summer holiday (and student overdraft) I travelled to Thailand alongside 10 other students from across Britain, with International Student Volunteers (ISV) an organisation that excels in voluntary work for University students abroad. 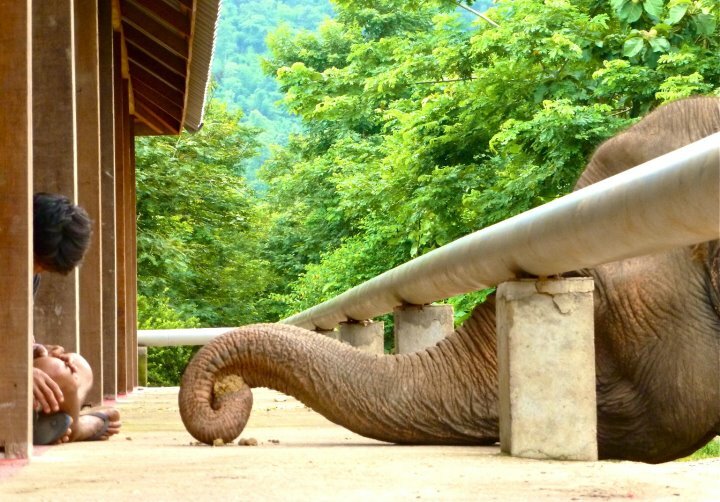 ENP was opened in 1995 by Sangduen Chailert (known as Lek meaning ‘small’ in Thai) whose childhood spent close to elephants established her extraordinary relationship with them. Growing up her grandfather had an elephant to help him with farming chores and Lek soon felt him to be part of their family. When the Thai government made commercial logging – the main source of elephant employment – illegal in 1989 many domesticated elephants and their owners were suddenly left with a lack of viable options: either sell their elephant to a trekking company used for rides or take them to the cities to beg. So it was after an 11 hour flight from London followed by a further 2 hours flying to Chiang Mai, that myself and my fellow volunteers pulled into the ENP, our new home for a week. Arriving at the park depicts an unforgettable scene. An array of hills enshrouded by a thick heavy fog serves as a dramatic backdrop to the wet lush grass that is the elephant’s playground. Standing on a bamboo balcony that extends from the main viewing platform high above the ground prompted flashbacks of a scene from Jurassic Park as we nervously awaited the thrill of seeing these creatures. Then a flash of a tail here, a whip of a trunk there, the elephants slowly revealed themselves from the mist, foot by trunk, as they came over to greet us. And suddenly I knew we were a long way from home. We dumped our bags in our wooden huts that served as our bedrooms, barely having time to notice the geckos pressed against the roof or the mosquito nets protecting us from bites, and started our voluntary work straight away. We did two daily tasks including cleaning up elephant poop, washing the elephant’s fruit and preparing lunch. We also carried out grounds maintenance including painting huts and fixing broken fences as well as working on some crucial conservation projects such as planting hundreds of banana trees in nearby land that will eventually grow to be a food source for the elephants. Each day and each new task was exciting and different; one memorable morning we were driven into a field high in the hills and were casually handed 3 feet long machetes to chop down bamboo for the elephant’s snack. I only hoped the 35 degree temperature didn’t go to anyone’s head! A large area of the park is devoted to the elephant kitchen where all the elephant’s meals are delivered and prepared. An adult elephant can consume up to a whopping 136 kilograms of food in a single day on a diet of roots, grasses and fruit, and they eat a lot of these things. An extensive amount of time and effort goes into keeping these hefty herbivores happy and after tossing, washing and cutting endless watermelons, pumpkins and sack-fulls of corn in the baking hot heat, we got that message. I was nervous at first feeding the elephants, scared I would get bitten, but their trunks are actually a long nose containing about 100,000 different muscles and generally more snotty than sharp.We carried our basketfuls of assorted fruit and veg over to the feeding platform where they were devoured quickly. The elephants rush over, one per basket, and swing their thick trunks in for a potential meal. I gingerly held out a chunk of pumpkin and swiftly my hungry friend extracted it from my hand and swung it back effortlessly into a pink open mouth. This process was rapidly repeated and before I knew it my basket was empty and my peckish customer was tracing a trunk over the platform hovering up morsels. Each day the park welcomes a herd of excited holiday makers and travellers who arrive at noon just in time for the bathing of the elephants. High spirits are noticeable as the opportunity to get up close and personal with these friendly creatures is offered to the daily influx of visitors. Armed with buckets, bristly brushes and cameras they meet the elephants by the waterside where a flowing river surrounds the park. Elephants relish in bucketfuls of refreshing water thrown at them and enjoy showering by sucking up the water in their trunks and shooting it onto their backs. They enjoy getting brushed behind the ears and the water cools and soothes their thick exterior, but don’t be surprised when the elephant saunters, after a good old scrubbing, directly into a pool of mud – it is actually a natural sunscreen for their wrinkly skin. A sizeable medical centre also dominates a section of the grounds at ENP and is run by a small veterinary staff. Among the clinic’s patients are a permanently blind female who was shot in both eyes with a sling shot; a force-bred teenager with a deformed hip and a young male who suffered broken bones after being hit and dragged by an 18-wheel truck whilst begging in the congestion of the city. Seeing the permanent physical damage is an indication of the horror these elephants have been through and a reminder that so many more like them are currently being exploited. Our group was teamed up for the week with local man Jacabo Moynhu or Jack, 25, who guided us in our understanding of the sad world of elephant tourism. Jack, who has worked at the park for 5 years, told us how elephants have always been symbolic of Thailand and in the past were emblems of royal power, but people visiting the country today typically associate elephants with street begging, or as a means of entertainment in trekking camps offering their backs to eager holiday makers. 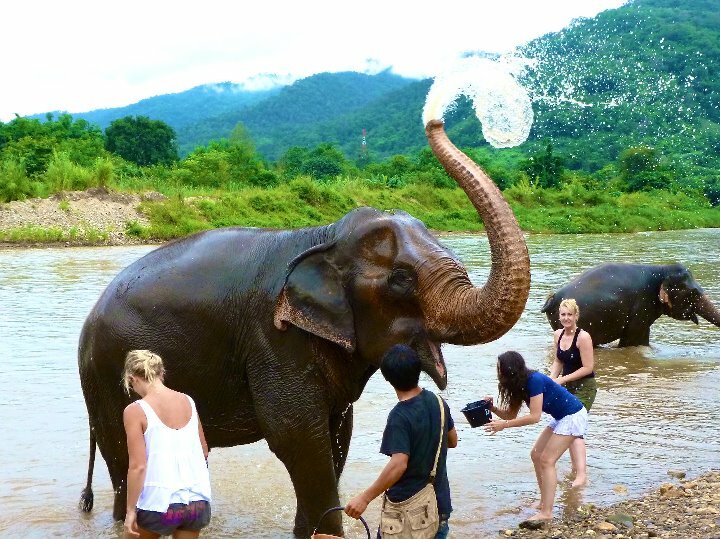 Elephants are a major draw card for tourists and their owners take advantage of this. As part of our learning, Jack prompted us to watch some hard-hitting DVDs showing how the elephant becomes submissive to its master. Trekking camps are the modern day equivalent of a travelling circus and elephants have been extensively trained to sit still for rides as well as perform demeaning, back-breaking tricks for small audiences such as playing basketball and waving goodbye. Entertainment of this kind involves a horrific and lengthy discipline procedure where the owner aims to ‘break the elephant’s spirit’ and establish he is in charge. Violent training approaches such as starvation, chaining its legs together, jabbing it in the sides and ears with hooks and kicking it in the stomach leave the defeated elephant understanding it is to be controlled by its owner; it will follow specific commands on queue and is then ready to be exploited for money. It was very disturbing to see the majestic and kind elephants we’d bonded with being beaten, I don’t think any noise is more spine-chilling than the shrill wail of an elephant in pain. Before the park opened its doors for the day and the excitement and splashing and flashing of cameras began, my group and I took advantage of living on site and rose at around 5am on the last morning to sit on the platform and watch the sun rise. After eating, sleeping and breathing all things elephant for a week, I suddenly wanted to cry thinking of everything the elephants had been through at the hands of man and felt terrified they should have to suffer again. But as a soft morning glow slowly crept in and illuminated their carefree faces, a poignant sense of calm radiated around the park. As the elephants strolled happy and strong around their sanctuary in the new light, I knew they would be fine. They were in safe hands, finally. Posted in Features and tagged Elephant Nature Park, Thailand, Travel. Bookmark the permalink.